Discussion in 'Philosophy' started by reallife, Oct 19, 2018. To avoid confrontation, go to events or places where people expect and tolerate cameras. Ask permission and have a good answer when they ask "why?" Never photograph kids without permission from their parents. I would consider a cell phone camera or something with a silent shutter. Gary's right on the money! I’m on a good run at 50+ years without a scar For me, it’s always been a game of disguise. The more conspicuous you look, the more attention you’ll attract - you have to blend in. As Gary says, "If you’re seen by others as part of the street, they might not be as likely to be suspicious of you. If you sneak around, you won’t feel good and people who don’t know you won’t feel good about you either". One way I avoid this is to openly take multiple shots (later deleted unless there's a happy surprise) of things on either side of my “target” in a slow sweeping series that includes the image(s) I really want. Talking with the people around you about the location and what you see there is also a great ice breaker. We've been guided to many places and sights we would have missed had a local not suggested them to us. As a kid, I used my family’s Kodak 126 (?) folding bellows camera with a 90 degree waist level viewfinder, discovering early how much easier it was to be inconspicuous when the camera’s not at eye level. With articulating view screens, I can now shoot from waist level with a much higher success rate than ever. Holding the camera high overhead also works well, although it's harder to keep it steady with your arms fully extended. I'd love to try a body cam with a wireless link to my phone or tablet, too. 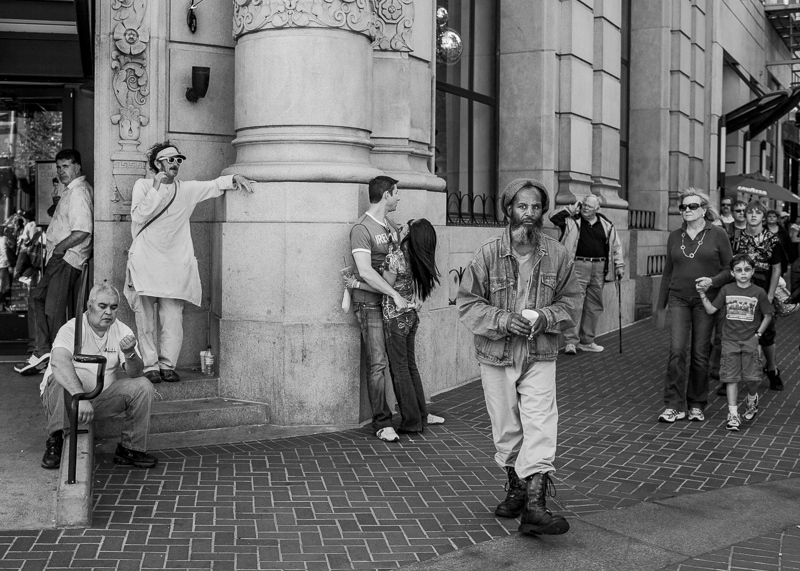 If the IQ is good enough, that may be a wonderful approach to street imaging. jason_withers, Jochen and tom_halfhill like this. I've only had bad reactions when I've tried to sneak shots. I learned pretty quickly to not do that. Photographers shooting in a deceptive manner (hiding camera while shooting, pretending to look one direction while shooting in another, fiddling with camera while sneaking a shot, hip shots, etc) can result in an adverse encounter. People on the street are very perceptive to what they believe is suspicious and/or nervous behavior. I've never had a problem shooting candidly out in the open with camera raised to my eye. If someone asks what I'm doing I just say "I'm documenting the city," or, "it's for my blog." And then hit them up for a posed street portrait - to which often results in a "sure." KRB, ken_kuzenski, tom_halfhill and 5 others like this. "Public paranoia is at a new high these days" Otislynch person. Best not sht yourself taking street photos. When the Nazi regime was murdering folk (among many many other regimes past and present ) the majority of documentry/street ….well..
ken_kuzenski and janedragon like this. There's a reason why a short telephoto is a "street lens" as opposed to a normal lens, I suppose. 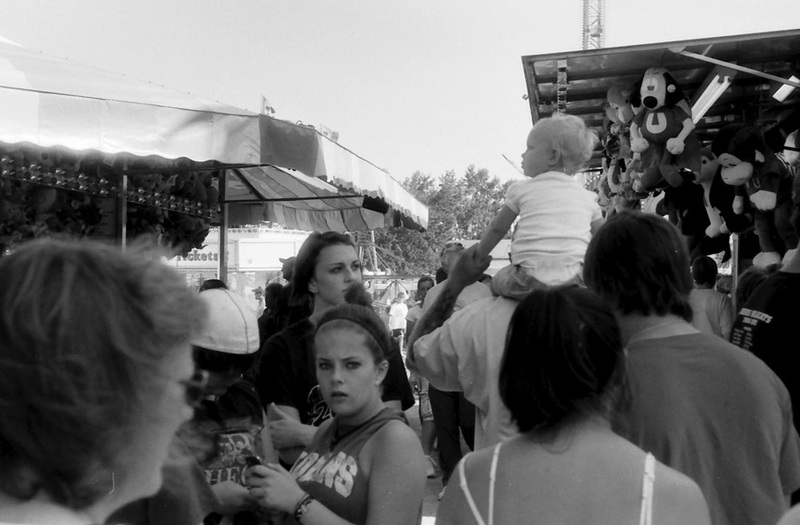 Here is a carnival shot using an 85mm Jupiter on a transmogrified Kiev. I've always felt the best "street" images are of people totally unaware of the photographer's presence before the exposure is made. Once they become aware the relationship changes, sometimes for the worse. Call it the Observer Effect in photography. Once they become aware the relationship changes, sometimes for the worse. And often times for the better. Photos by William Klein, Graciela Iturbide, Daido Moriyama, Manuel Alvarez Bravo, Dorothea Lange, Diane Arbus, Susan Meiselas, and Bruce Gilden immediately come to mind. I've always felt the best "street" images are of people totally unaware of the photographer's presence before the exposure is made. I’ve always felt the best street images are ones that capture penetrating expressions, gestures, sights, and the overall feel of life on the street. 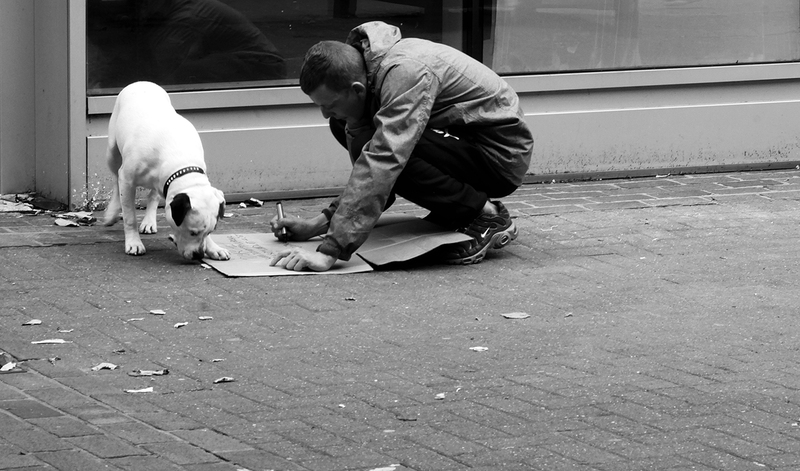 I’ve also appreciated street photos that create their own sense of theater out of what’s found on the street. Martin Parr did a little of that. A lot can be done when people are aware of the photographer or not. A lot of street shooters put a premium on candid approaches. Such approaches can be great but candidness can also act as a fetish, demanding more attention than it deserves. There's a sense among some that candidness is the “real” approach to photography where people will be themselves. I think a good photographer can form a “relationship” with his subjects, whether in the blink of an eye or over a period of time, that can capture significant reality, often even when very intentionally shot, posed, or forced. Reality, and the street, comes in all flavors. After a photo or two many subjects will forget you are there and start acting naturally again. You already have permission, just keep on photographing. How do you do that "quote" thing? I had to use "copy/paste". To quote the entire post of someone, hit the REPLY link in the bottom right hand corner of their post. It will then come up as a quote and specify their name. If you just want to quote a part of their post, highlight that part of their text and once the text is highlighted and you let go of the cursor, a little box should come up under the highlighted text that says REPLY. Just click on that. This will only provide a grey box that the quote will appear in, but the NOT the name of the person you're quoting. To get the name, you have to hit REPLY either for their full post or for the part of their post you want to quote. After a photo or two many subjects will forget you are there and start acting naturally again. My goal, even on the street, is not always (though it is sometimes) to photograph people acting "naturally." Sometimes I prefer working with very intentional poses, sometimes very UNNATURAL situations. Just like in theater or fiction, deliberate fabrication can tell a lot of truth, especially helped by an understanding of visual metaphor, if handled well. "Natural", like "candid", works in a lot of situations but are often overrated and often overlook the power of more deliberate and intentional posing or setups. Some great street portraits, for example, are not natural. They are posed and situated very deliberately and thoughtfully by photographer and subject. They are expressive, gestural, and often very important contributions to street photography. Funny, it turned my example into the desired result. In order to get a grey quote box without the name of the person you're quoting, you have to start the text with BRACKET then the word QUOTE and then a closing BRACKET. Then type the text you want in the gray box, then follow it with BRACKET FORWARD SLASH QUOTE BRACKET. Add a smile and a waive. Surprise yourself JD. "chronic low level anxiety when it comes to approaching people in public" Robert. Me, I have the same fear about spiders....is there anything more scary than a big daddy long legs crawling about in your bath!. Nope, the pits. But being big boys, wearing long pants, we address these fears and overcome them...cause we are big boys and wear long pants. Scared folk achieve nothing other than being scared.